At Cheezburger, Openness and Honesty are a part of our core values. We’ve taken a first step by issuing this report. In the process, we have learned that we can compile this report faster and provide better detail by improving certain processes. It may seem overkill to publish this when the number of Government Requests are zero, but best practices should be established prior to requests being received. We’re a small company with a big reach. Although we lack the resources of a larger company in compiling these reports, we don’t receive as many requests. Our challenge was thinking deeply about the impact of our policies on our users and how we can be consistent. This report includes totals of requests for user information, insight into our policies, and requests for content removal. I realize this report may be a bit dry, so we’ve included a special transparency report item for 2014. We may be a group of Internet cat picture herders, but we love our users and we are proud to stand up for their rights. If we can take this first step, so can everyone else. If you would like to know the standards we aspire to, visit “Who Has Your Back”. My hope is that by making this the most entertaining Transparency Report you’ll read this year, other startups will (like the evolution of 404 pages) see this an opportunity to communicate with their public and help build their brand. This report covers all sites in the Cheezburger network including Know Your Meme, FAIL Blog, Memebase, I Can Has, The Daily What, Geek Universe, etc. A government agency or branch (e.g., law enforcement) may ask Cheezburger to remove content, or request information about a particular user. Government requests to withhold notice from users will be reviewed by our counsel for legal weight. Cheezburger’s policy is to disregard requests without binding demands. Our goal is to provide notice to affected users in advance of disclosure unless prohibited by a court order. There will be exceptions to this goal of advance disclosure such as in the case of Emergency Requests as stated in this report. As of February 5, 2015, Cheezburger has never received a National Security Letter, an order under the Foreign Intelligence Surveillance Act, or any other classified request for user information. 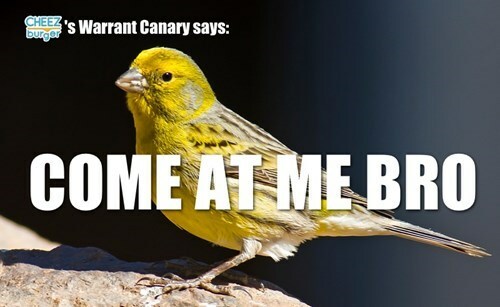 What’s a Warrant Canary? Glad you asked. Subpoenas are investigatory tools that state and federal governments can usually issue without judicial oversight. Cheezburger is currently in the process of drafting a policy on dealing with subpoenas from Government Entities. Unless prohibited by court order, Cheezburger will inform users of state and federal civil subpoenas for their information in order to give them an opportunity to challenge the subpoena(s) before we disclose any information. Cheezburger requires a search warrant to be approved by a judge and based on probable cause to disclose user content information, which includes private messages, images, links, and posts/comments that have been deleted or otherwise hidden from public view. Cheezburger is a US-based company. Therefore, we will not turn over user information in response to a formal request by a non-US government unless a US court requires it. In some cases, a foreign government may use a MLAT (Mutual Legal Assistance Treaty) to seek information through the US justice system and therefore those requests will fall outside this section. An Emergency Request is not a legal definition, but a class of request by law enforcement or a government agency with clear justification that our action in disclosing user information will result in preventing imminent and serious bodily harm to a person. Cheezburger has received no emergency requests in 2014. Our policy is to request reasoning for all emergency requests in writing prior to carrying out the request. The user will be informed when an Emergency Request has been carried out after the disclosure unless prohibited by a court order. Every request for content removal is reviewed by a member of our community team. We reject copyright takedown requests if they do not conform to the standards set forth in the Digital Millennium Copyright Act (DMCA). If we receive a copyright request that does not conform to the standards of the DMCA, we will refer them to our copyright policy page. The requester is free to resubmit the request. We will make an effort to inform the affected user(s) with the full text of the request based on the contact information supplied to us. The user may provide a counter-notification according to our Copyright Policy. We will restore any counter-notified content after legally required downtime has passed. Any counter-notified content will not count as a strike against the user’s copyright strikes. Every request related to trademark violations is reviewed by a member of our community team. We reject trademark-related requests if they do not conform to the standards set forth in our Terms of Service. If we receive a trademark-related request that does not conform to our Terms of Service, we will refer them to our Terms of Service page. The requester is free to resubmit the request. We will make an effort to inform the user(s) with the full text of the request based on the contact information supplied to us. The user may counter-notify us to dispute the trademark-related request and Cheezburger staff will review the counter-notification. Cheezburger did not receive any US federal or state government requests for the removal of content in 2014. We also did not receive any removal request form foreign government entities. All requests related to the removal of songs from any future karaoke list can be sent here. 11 Comments	| Leave another comment! Nice soundtrack for the karaoke. LOVE IT! I would like to be a fly on YOUR wall at THAT partay!! !